The benefits of massage are generally well-known: massage helps to decrease pain, lower stress levels, and improve circulation. At Soak Spa, you’ll notice your massage includes heat in every massage: the table is heated, and your therapist applies hot towels and heated rice/flax seed packs during your massage. Soak Spa’s incorporation of heat in massage is intentional, and serves three purposes. Muscle pain – especially pain from overexertion, muscle cramping, and other types of non-inflammatory pain – benefit greatly from the application of heat. Pain receptors tell muscles to contract to avoid additional pain or damage. During a massage, the muscles begin to relax, decreasing spasms. Applying heat at the same time soothes the pain receptors and increases blood flow to the areas experiencing pain. When you apply heat to sore muscles, the heat actually loosens and relaxes the tension in the muscles. When the muscles relax, the soreness and knots built up over time are lessened. That’s why after a hot bath, you feel more relaxed – there’s nothing better for removing tension and stress from your body. It’s a ritual that’s been used for centuries to help relieve muscle soreness. Muscles lacking enough oxygen or hydration tend to cramp. If you have poor circulation or don’t drink enough fluids, you’ve probably experienced muscle cramping or spasms. Applying heat allows the muscles loosen, and the spasms and cramps either diminish or disappear completely. Heat enhancements such as rice or flax seed packs deepen the benefits of massage on the circulatory system. Because heat penetrates tissue deeply, it is an effective way to ensure the body is more receptive to the benefits of a healing massage. Blood vessels open more fully, increasing the flow of blood – and, more importantly, the oxygen it carries – to the area, helping to heal tissues and relax muscles. Heat therapy, when used in massage, is not only beneficial for your physiological well-being, but it can also help with your mental health and wellness. Suffering from pain, whether occasional or chronic, makes it difficult to concentrate on tasks. Not being able to concentrate means you can’t perform at your best, which in turn causes anxiety. Eliminating pain through techniques such as heat and massage also decreases stress, allowing you to function at your best. Plus, feeling good puts you in a better mood. Originally from Louisiana, Soak Spa’s owner, Melissa Stewart, incorporates a long-held Louisiana tradition known as lagniappe, or “a little something extra”, into each service offered at Soak Spa. 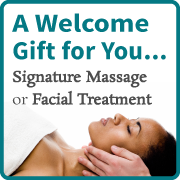 For massage clients, these extras include aromatherapy inhalations, heated rice or flax seed packs and hot towels, along with the option to add a hot stone, aromatherapy, foot and hand scrub, and extended scalp massage enhancements – taking a relaxing experience to a luxurious level. For Melissa, this practice is a way for her to ensure each guest enjoys the benefits associated with their service…and a little something extra. How are your muscles feeling? Are you in need of relief and relaxation? Check out our massage options and make your reservation today!